Aloha 'Aui'na la (good afternoon), thank you for coming to the Hawaii's State Advisory Committee Press Conference. In Hawaiian prodigal, we do a chant and prayer to the gods to be with us for guidance and protection, in an important occasion such as this. The chant I would like to do, calls the gods from near and far to be with us as we conduct this Press Conference. The Chant is called E Ho Mai. (E HO MAI) Chant performed. We do a great job for your precious child. Continue your good work with us here, lead us as you do in heaven and on earth. In the name of the Father, and his precious son, and the Holy Ghost. Excerpts of Kahu Charles K. Maxwell's Sr. presentation. Let me thank you again for coming today and I would like to tell you that I am from the Island of Maui, born in Napili, Lahaina and raised on the slopes of our 10,000 foot volcano Haleakala and still lives on its slopes in Pukalani. 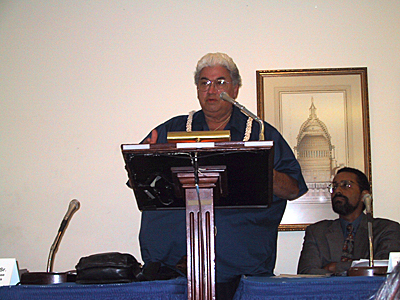 I have been involved in the Hawaiian movement since 1970 and in 1971 came to Washington D.C. for first time. Prior to that I had never left Hawaii. We spent several weeks in Washington D.C., researching the Federal Archives and found a lot of information on what happened to the Overthrow of our Hawaiian Kingdom in 1893. I would like to give you a brief historical history. Our ancestors always knew that Hawai'i existed from chants and stories of the Earth mother Papa and the Sky Father Wakea creating these islands we call Hawai'i. We came to these shores over 2000 years ago and populated these lands for 1300 years until Capt. James Cook stumbled on the Hawaiian Islands, looking for a passage around the America's. The world found out about Hawaii after his ships returned to England and Hawai'i, was changed forever. In just 42 years when the first missionaries arrived, they estimated over 1/3rd of the Hawaiian population had perished from diseases brought by Capt. Cook and the ships that followed. Capt. Cook estimated the population to be between five hundred thousand to eight hundred thousand. The Hawaiian people suffered another onslaught by the missionaries who brought the word of the lord, but also found that the land was so fertile, "anything would grow in the lava soil" By using religion, they became trusted advisors to the royalty and changed the land system whereby anyone could purchase land in Hawai'i. Sugar and Pineapple became king and the new owners of Hawai'i, were former missionaries and their children, who were sent back to Boston to be educated and returned to Hawai'i to run the businesses. The businessmen who for many years were planning to make Hawaii a Territory of the United States slowly took the Monarchs powers away. Finally in 1893 with the help of armed troops from the U.S.S Boston, they overthrew the reigning Monarch, Queen Liliuokalani. For many years they tried to annex Hawaii to America and even the U.S. Congress would not pass a joint resolution. Congress then passed a simple Resolution that was read on the steps of the Government Building in Honolulu, declaring Annexation, completely in violation of the U.S. Constitution. 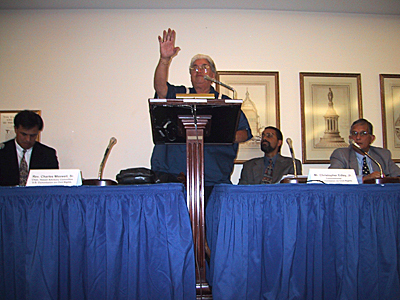 The Kanaka Maoli (Hawaiian People) voted 98% against the Annexation, but their wishes fell on deaf ears. In 1959, America made Hawaii into the 50th State by a yes or no vote of all the people in Hawaii. No choice was given and no vote was taken from the true owners of Hawaii, the Kanaka Maoli. We have been under the United States of America for the last 108 years and how have we fared. Well, presently we make up all the social ills in Hawai'i and in two incidents, Education and Health; we are the worst in the nation. Our men make up 83% of the prison population and our women make up 77%. We are on the bottom of the economic ladder, the highest percentage of suicide, drugs, welfare, and homeless. There are about 500 homeless people on Maui alone and majority of them are Kanaka Maoli but with entire families living in cars, on the beaches. They work several jobs but not enough to rent a home. Because of the lack of educational opportunities, they tend to work at service-oriented jobs in the hotels and other places and management are usually brought in from elsewhere. Self-determination is the only answer and our national lands must be returned and nation building must take place. We must be recognized as the aboriginal people of Hawaii, by the United States so that we could seek recognition Internationally. If our culture is to survive into this Millennium, we must have control of our destiny so that our children born and unborn can experience the rich culture that was passed down from our ancestors and they too will have something to offer to their generation until the end of time. Mahalo a nui loa kakou, thank you very much.